It is that time of the year again, where we shut our books (not like they were always open), and make our way to stations, and airports. Summer holidays are upon us, and that means vacation! I could not be happier. It will be a welcome respite from the stifling college environment. For me, one of the main problems I face is “what should I pack?”. And I don’t think I’m alone. All of us face dilemmas with respect to what to pack, and how to pack. Should I fold my clothes or roll them? One jacket or two? Should I take extra shoes?… and the questions go on. And so, I decided to do this. I’m not a minimal packer. I maximise every inch of space I get. But I’m leaning towards the concept of packing less and making the most of it. After all, your styling ability isn’t great if you wear 10 different things on 10 different days; it’s great if you use six different items for 10 different outfits. I’m trying to go for a maximalist-meets-minimalist packing strategy, by following these simple steps. Whatever your destination, research online for the weather you can expect. This seems like an obvious point, but I can’t stress it enough. By researching about the country/city, you’ll know what precautions to take. Travel forums like Rick Steves (for Europe), and websites like Lonely Planet are a godsend. You’ll know what weather to expect, precautions against pickpockets (if any), and maybe even great local restaurants. Plus, if you travel without an itinerary, you can discover the places you must not miss. The weather seems alright, mostly warm (which is actually cool for me, 20 C), with scattered rain. 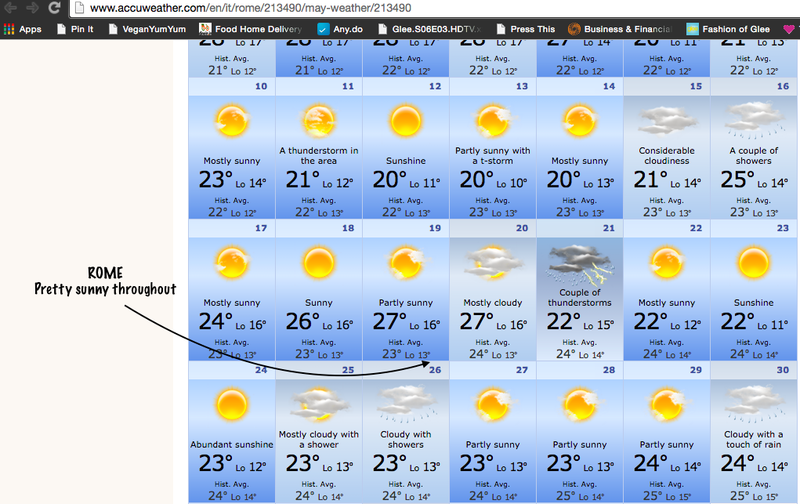 So must pack appropriate outerwear. This is where your research comes handy. Pick clothes appropriate for the weather. This would also be a good time to buy some layers that might be useful— for example, a puffer coat if you’re heading to a snow location. If you’re like me, and buy dresses in the hope to wear them on vacation, choose them but pick layers as necessary. If you have a low cold tolerance (like me! ), even 20 C will seem chilly. It’s very important to know you will not be warm with one bulky layer, but many light layers. Don’t ask me how, but it’s true. So do not choose three coats, or two wool jackets; rather, try a tank + shirt + sweater + jacket combination. This will make packing easier, and you’ll have less bulk on your hands. 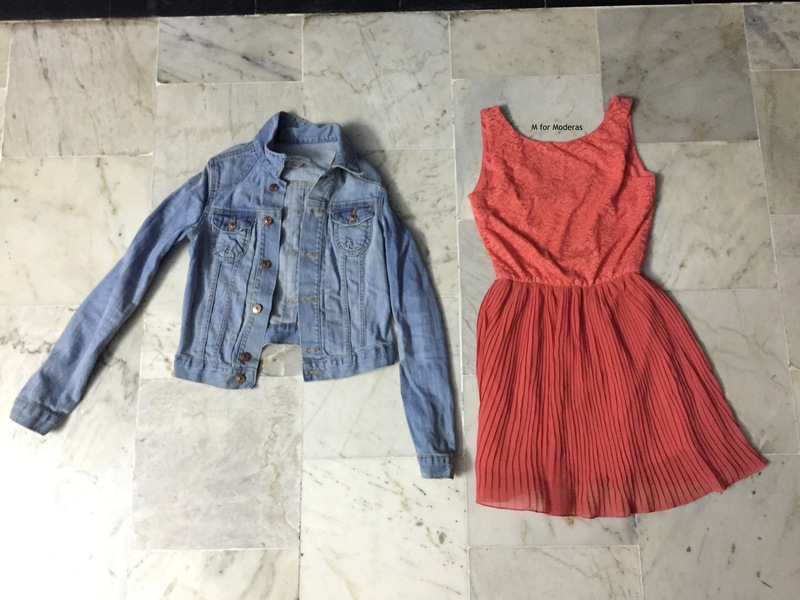 Plus, lighter layers mean you can discard them easily if the weather becomes warmer. Also pick clothes according to what you’re going to be doing. Parties = dressier pieces. No walking? Leave the cushy walking shoes at home. Considering the destination, I need to take separates that I can layer— jackets, and a trench coat should do. I’m also thinking of a few dresses, as well as tops, and two pairs of trousers. 3. Take out whatever you can’t wear in more than one way. At this point, dresses may be eliminated; two or three dresses are fine. I feel you, we can’t wear many dresses in Chennai, so we save them for vacation. Don’t take too many dresses, even you’ll get tired of them. Pack one or two pairs of trousers, and three tops/blouses for each of them. No one’s going to notice that you repeated a pair of jeans thrice, or more. I encourage that. 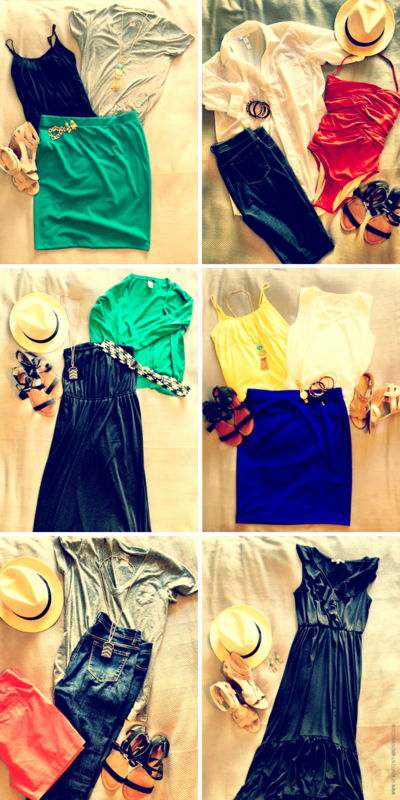 Take a few (less than four) spare items- a blouse, a tee, and the like- in case there are changes in your travel plans. 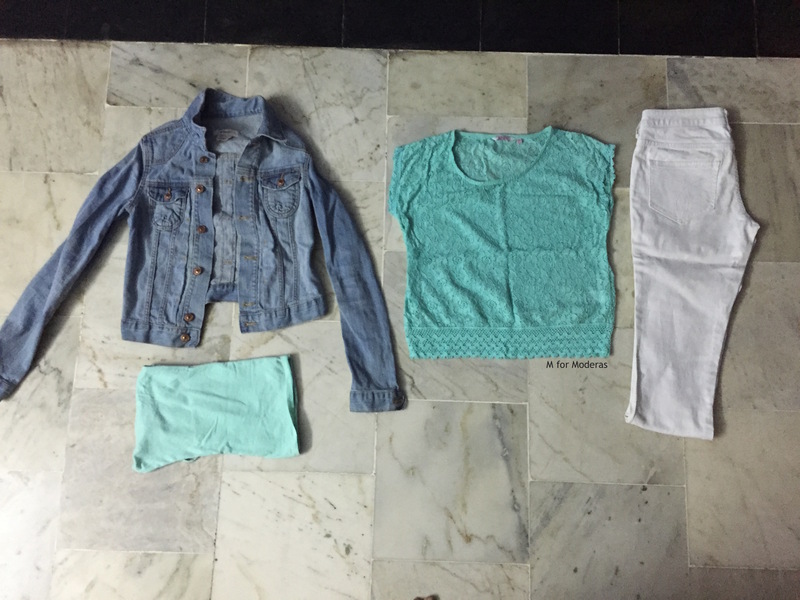 I selected three dresses, two jackets, two pairs of trousers, a trench coat, and five tops. That seems like a lot but it actually isn’t. I also decided on a pair of tights (full black) to have on hand. 13 pieces for 10 days seems excessive but this is maximalist meets minimalist after all. I will not be repeating any tops. Try to take as many multitasking pieces as possible. 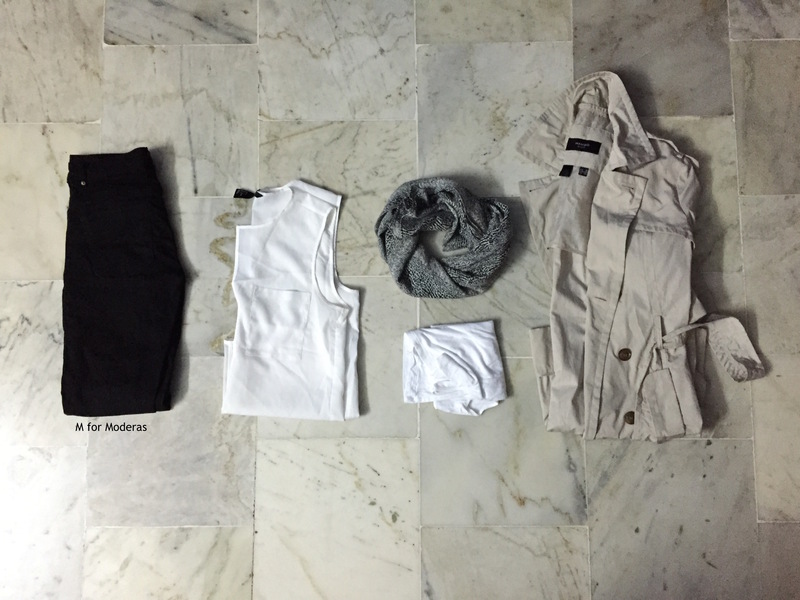 Plan, and store outfits chronologically. Yes, this seems cumbersome. It is. I’m trying to make sense of the pieces I’ve picked, and it muddles me. But if you get this done, take pictures of the outfits, and store them on your phone, you can get out the door in a flash. It might seem confusing, and excess work, but you won’t feel guilty about packing a lot, and not wearing it. Something like what has been pictured above will work. Related to #1, when you know what you will be doing, pack your shoes accordingly. If your shoes are heavy, and bulky (boots, hiking shoes, etc), wear them on your way there, in the train/plane/car. Italy is known to be a place where you must keep walking. Considering the possible rain, I was thinking of buying some waterproof walking shoes that are cute, and functional. Sperrys have some good stuff (might pick them up in Bangkok), as do Skechers (available online). I also wanted them in black so that even if I wear tights, they won’t break the lines of my feet, and make them look short (#protip). If you are taking normal canvas sneakers (Bata rocks), put an insole in them to make sure your feet won’t hurt after a long day. That’s all for part 1! See you next time with part 2! Did you find this post helpful? Or do you have a tip for me? Tell me in the comments! Don’t forget room in your case for bringing back souvenirs! Yes, definitely 😀 Thanks for reading! Here are some great tips how you can also be “fashionably forward” on your travels!